Are you experiencing Windows 2000 installation problem on your SGI 320/540 visual workstation? Windows 2000 Server/Professtional systems are working great in SGI 320/540 Systems!!! Please read the following description to find out the possible solutions. * This information includes the possible solution for the application error message : "The application failed to initialize properly (0xc0000142)" which could happen after you installed Windows 2000 and SGI SSK. Try this information with your own risk. This information provider is not responsible for any problems coming through this information. After you installed Windows 2000 system and SGI SSK into your SGI 320/540 machine(upgraded from WinNT or clean installed with Windows 2000), your system start to display application initialization(or any similiar errors like error code 0xc0000142) errors. Even you install the current SGI drivers, the situation is same. You are only able to execute some limited Windows applications - time dependently. Most of time, many of the applications are not initialized correctly, so we are not able to execute those. Silicon Graphics Control Panel/Color Lock is not launched and unable to execute. The following is the solution to solve this problem. But, be sure that this solution is for your SGI 320/540 Visual Workstation only. Your system might be configured with SGI default devices. If you have any additional devices and the problem comes from your additional devices, I do not guarantee the result. Please be sure your system has Cobalt graphics card, SGI 1600 SW Monitor, and other input/output devices. If you have any questions about your systems configuration, please let me know using my email addres at the end. Look at the following screen copies how it works! Now, Lets start our Windows 2000 systems installation. There are couple of ways you can install Windows 2000. But, at this time, lets assume you are trying to upgrade your system from Windows NT or trying to clean install your system(I recommand this option because most of your old applications will not be able to use after Windows 2000 installation). 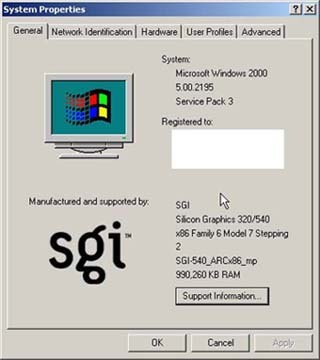 Because the purpose of this information is not teaching you how to install Windows 2000 system on your SGI 320/540, I'll start from the step just after you installed your Windows 2000. 1. Install Winsows 2000 System into your SGI 320/540 Visual Workstation - Please do not install anything else. I'll let you know the time for the others. Everything should be fine at this time except the VGA(256 color mode). After you installed Windows 2000 system, you will be asked to reboot your system. Please do that and check your system whether it start up normally. Because, at this time, everything was initialized by Windows 2000 system, it should be fine and no system errors. But maybe some application cause an error if you upgraded your system from WinNt. Then you may uninstall that application - actually there are so many application are not running(not compatible) under Windows 2000 system. O.K, now lets go back to our topic. After you installed Windows 2000 system(Professional or Server edition), I recommand you not applying any Windows Service Packs or Upgrades. Even do not think about installing SGI 320/540 SSK, Media Pack, Cobalt Graphics driver. I'll let you know the time when we install these software. And also you will start your own installation after we set up your PC. 3. Configure your system to connect to the internet. This is to download some driver files from the internet. Again, I'm not going to explain how to do this. Do not change other system configuration. Until this point of time, you are still able to use 256 colors only. Please check this from your display control panel. If system displays other than 256 colors, you are not using SGI default Cobalt graphics card or SGI 1600SW flat panel display - as I told you, I'm guarantee the result in this case. 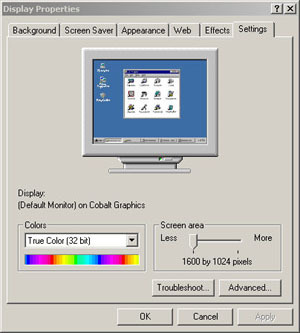 If the system displays other than 256 colors, even you only have 1600SW and Cobalt graphics card, it's because of your old Windows NT system. I recommancd you clean install your system with Windows 2000. 4. Install WinZip s/w - this will be used to unzip the driver files later. if you want to install SGI openGL screen saver and wallpapers, be ready your SGI Recovery CD2. Do not install anything. To download above softwares you may need to log on SGI web site. You can easily create your own logon id with your few information. 6. Important! Go to Control Panel and open System Propertie. Click Hareware submenu and go to Device Manager. Expand Display Atapters. This wil show your current display adapter 'sglfb'. Actually this driver is pointing to your flat panel 1600SW with sglfb.sys file in your system32 folder. After you checked this driver, unzip your downloaded file vid-W2K-650.zip file into your temparay directory. 7. Click your right mouse button on sglfb display adapter and click properties. Click the Drivers submenu and check update Driver(actually sglfb driver coming with Windows 2000 is bad and not fit to SGI Flat Panel system. So, we need to replace it or have to make system not to use it). 8. From the Upgrade Device Driver Wizard, choose 'Display a list of known driver....' option. 9. Choose 'Have Disk' and point your system to the directory you unzipped your vid-W2K-650.zip file. Choose the file 'NVSG.inf'. 10. Windows system will display 5 different drivers. 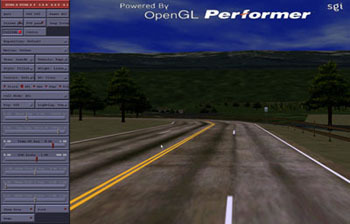 You can pick up any driver, but I recommand you to use VPro VR7 driver. Finish the upgrading display driver. Now system will display your new display driver, but will be effective after re-start. So, please restart your system. 11. (Optional) After system restart, if you want to install SGI recovery CD2, do it now. It will install several softwares into your system. Usually, I uninstall Quick Time just after the installation because it's too old version. Restart your system again. 12. Install SGI SSK and Reboot your system. Now, are you feeling better? Check your system on display control panel. Now you should be able to change your colors from 256 to 16bit/32bit mode. 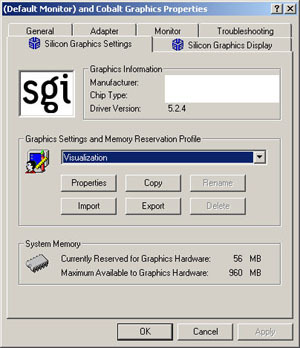 After your change the colors to 32bit mode, tune your system from SGI Graphics control panel. Change the 'Setting and Memory reservation profile' to Visualization mode and restart your system. 13. If you still have problems on your system, it's caused by ther other hardware. Try again the procedure without those hardware. After you reboot the system, install SGI Cobalt Graphics Driver and Degital Media Patch software. This will restart your system. 14. If you have no problems until this point, now you're safe and O.K. from SGI 320/540 Windows 2000 Installation problem. You can now install your own software and patch Windows Service Pack/Upgrades. * Looks like too simple? But sometimes if we miss just one small part, we can not operate the whole system!!! Like you understood during this procedure, actually the problems came from the Windows 2000 flat panel driver. It's only useful when Windows 2000 system reconignize your SGI flat panel monitor at first time. Do not disable this driver - if you do, it will make your system unbootable. But , after you finish your Windows 2000 installation following this guide, you can uninstall the VPro driver from your system. Again, do not disable this driver!!!!! 15. Congraturations! Please read the following terms and conditions again. Thanks. This information is free for all users, but only use this information when you agree with the followng terms and conditions. 1. Do not distribute this information. 2. Try this information with your own risk. This information provider is not responsible for any problems coming through this information. Last edited by administrator; 01-17-2006 at 12:56 PM.